VietNamNet Bridge – A database of energy efficiency in 280 large buildings in Viet Nam’s five biggest cities has been compiled and analysed under a four-year programme by the Ministry of Construction and the United States Agency for International Development. Vice minister of construction Phan Thi My Linh delivers speech at the event in Ha Noi yesterday. The first ever National Building Energy Performance Database includes the cities of Ha Noi, HCM City, Da Nang, Hai Phong and Can Tho. The US-funded project, presented yesterday in Ha Noi, aimed to identify energy usage and greenhouse gas emissions of buildings in Viet Nam with a view to reducing emissions in the future, said Vu Thi Kim Thoa of the USAID Viet Nam Clean Energy Programme. Thoa said five demonstration projects stimulating buildings’ energy usage in Ha Noi and HCM were also completed, and the buildings were upgraded. The projects consulted the buildings’ designers on using materials and new technologies to save from 22 per cent to 44.5 per cent of energy for the five buildings each year, equalling annual savings of US$170,563, she said. Emissions of over 1,000 tonnes of carbon dioxide would be reduced each year in the five buildings, she said. The buildings included the Ha Noi Energy Manager Training Centre, the State Securities Commission of Viet Nam, Viet Nam National Construction Consultants Corporation, the Truc Bach Building Complex and HCM City’s Capital Place. 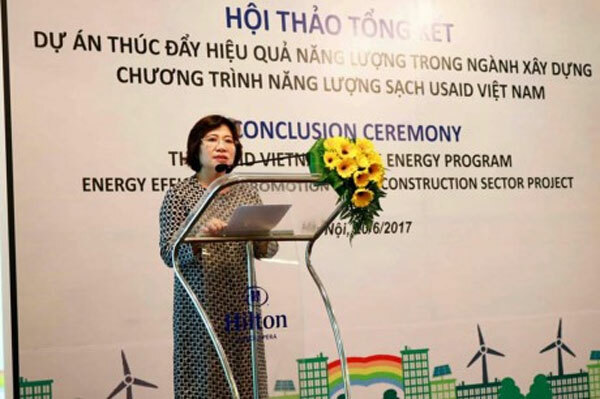 Additionally, 2,955 Vietnamese professionals and building owners, 26 per cent of them women, participated in training courses of design, construction and operating green buildings for energy efficiency, she said. The programme also promoted the use of energy-efficient building materials in the construction sector in order to reduce energy consumption throughout the buildings’ life cycle, she said. Luong Duc Long, president of the Viet Nam Institute for Building Materials, said the programme would serve as a foundation to compile a plan for reducing carbon dioxide emissions in manufacturing building materials that had large emission levels. For example, the plan scheduled a reduction of 4.37 million tonnes of carbon dioxide emission in producing cement and sanitary ware by 2020, he said. Do Binh Yen, former deputy director of the Institute of Energy Science, said the data samples collected this time had been considerably larger and more reliable than before. They included architectural and construction elements that were not collected before, he said. Data on ventilation, lighting and air-conditioning were added to energy-consumption measurements, he added. "We can say we now have a valuable database to drive energy planning policies forward," he said. Nguyen Thi Nhu Trang, a lecturer at Ha Noi Architectural University who participated in a training course under the programme, said she learned many new things, including energy stimulation allowing her to create a computer model of a building and calculate its energy efficiency. "This was the first time I’d used such software and it was very interesting," she said. She said she had imparted the knowledge to her students so that they could compare the energy consumption of green buildings and normal buildings. Nguyen Cong Thinh, deputy director of the Science, Technology and Environment Department under the Ministry of Construction, said the programme would allow the ministry to assess the current situation of the construction sector and issue a green growth action plan for the construction sector by 2020, with a vision to 2030.